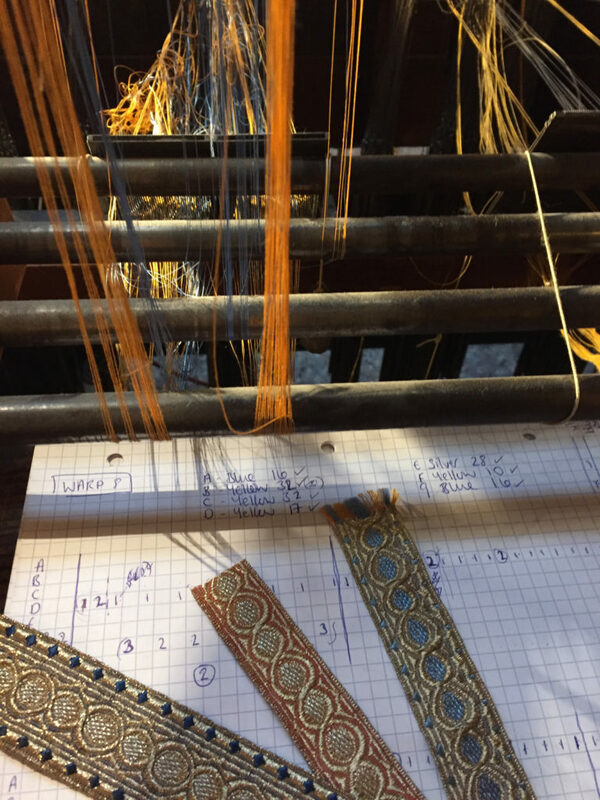 Work has been continuing steadily with the restoration of a 1920s ribbon Jacquard at the Deutsches Techniksmuseum in Berlin by Emma Wood & Birgit Zehlike. Following the initial assessment and cleaning of the loom, the latest task has been to mend or replace the eight warps that are currently threaded on. The first five of these warps are connected to the first Jacquard mechanism, and the last three are connected to the second Jacquard mechanism. Unfortunately there is no available threading plan, so the only keys to figuring out the threading of each of the eight warps were the old examples of woven ribbon and the original punchcards. 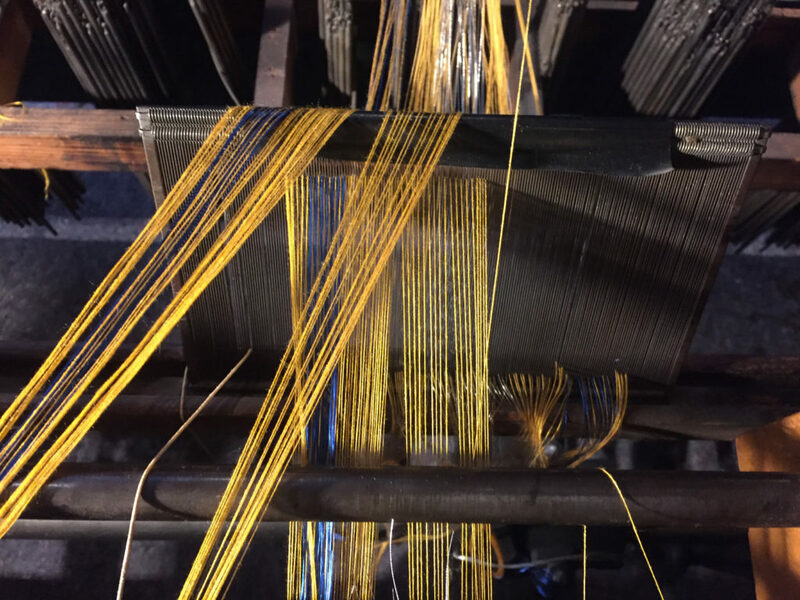 This meant Emma had to look at the damaged threading that currently existed on the loom, compare this to the ribbon samples, and then reconstruct what the warp order and threading should be ( image above). All of the eight ribbon warps use both the extra-warp and extra-weft techniques, and she was able to break each ribbon into a number of different design blocks. Once the design was broken down this way, it was much easier to calculate the correct threading plan. One of the warps was in relatively good shape, and required only a small amount of repair, but the other seven were too damaged to mend, and had to be rethreaded from the beginning. 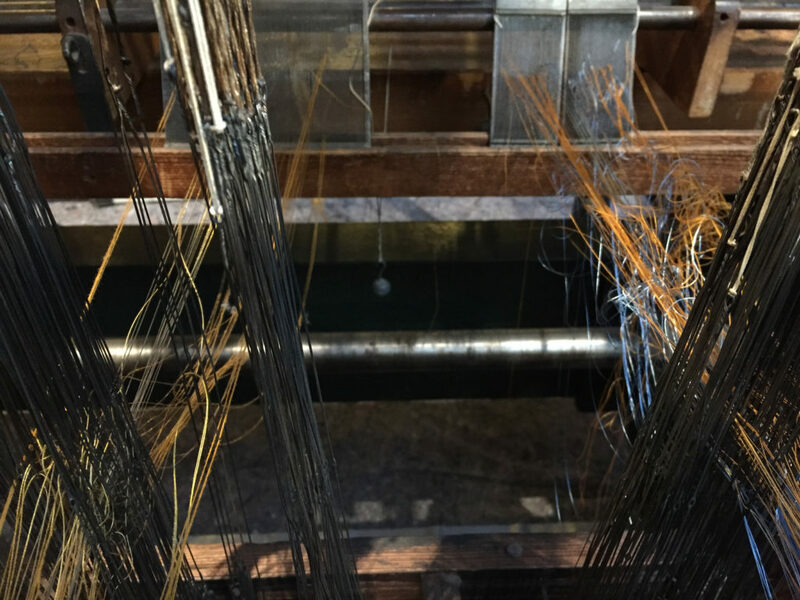 Each warp is made up of up to 8 different spools, and each spool can contain over 30 warp threads. The damage in each warp was often not just a case of knotted or broken warp ends, but of entirely twisted warps too. In some cases, an entire warp spool had broken off and tangled, and was simply hanging down from the top of the loom. 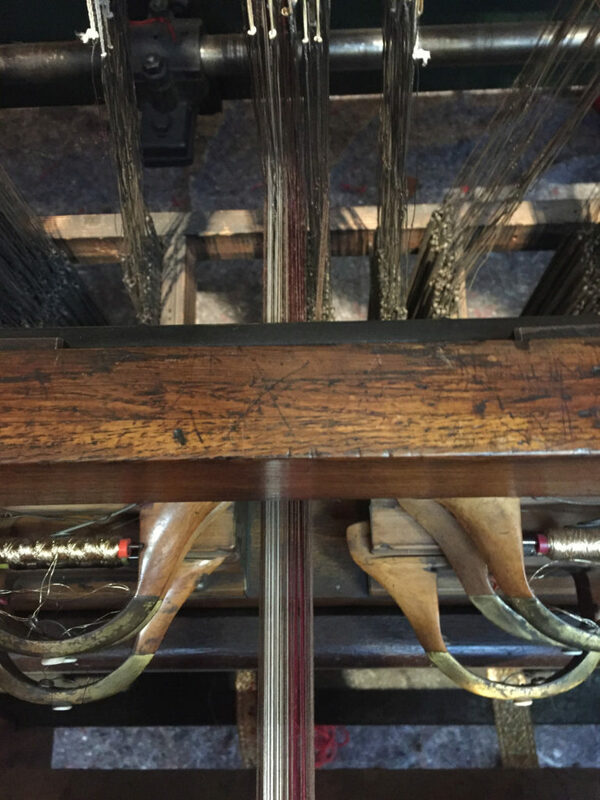 Therefore the steps in repairing each warp involve going back to the beginning and mending the warp spools to find the correct thread order, pulling all the ends through a back reed, threading the heddles, and finally pulling the ends through the front reed. Each warp takes on average 2 days to repair, so the progress has been slow, but the end is finally approaching! Whilst Emma was able to decipher the threading plans, Birgit managed to transfer the punchcard patterns into WeavePoint. They were then able to compare the threading with the lifting plan and to create a visualisation of each ribbon. Thankfully each visualisation and ribbon matched, which served as proof that the threading had been mended correctly. There is now only one warp left to finish rethreading, and this should be completed by the end of the week. After this has been done, the next step is to reapply all of the weights to each of the warp spools. The weights have shifted over the years, and a new balance has to be worked out in order to achieve the best tension for every spool. The only remaining steps for this phase of the restoration project will be to connect the eight repaired warps to the front roller beam, and to then rehang the punchcards and test the loom! Hopefully all of the team’s hard work will pay off, and the loom will be functioning once again, ready for live demonstrations for the museum’s visitors. 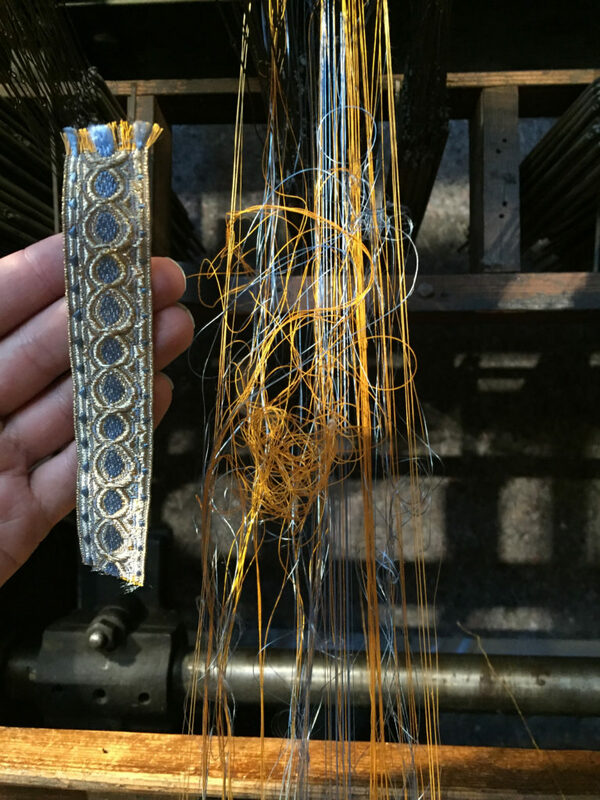 There are still further repairs that ideally need to be made to the loom – for example, the front roller beam cloths are badly worn and need replacing, the warped punchcards also need to be replaced, and multiple harness cords are missing from the two Jacquard mechanisms. However, the loom should still be to function without these repairs in the short-term, and hopefully the museum will look to continue the restoration in the new year. This entry was posted on Friday, October 28th, 2016 at 9:30 am	and is filed under Exhibitions, General, New weave developments, News. You can follow any comments to this entry through the RSS 2.0 feed. You can leave a comment, or trackback.